Why Bus Rapid Transit in Metropolitan Richmond? In a 2011 Brookings Institute study, "Missed Opportunity: Transit and Jobs in Metropolitan America," Richmond ranked 92 out of 100 major U.S. cities with regards to job access by public transportation. Currently in our metropolitan area, having the capacity to own and drive a car is requisite for access to the full range of job training, employment, higher education, healthy food, medical care, and cultural gifts that our region has to offer. Numerous analyses have highlighted repeatedly our need for metropolitan-wide transportation, in the name of justice, economic development, and mutual prosperity. Rapid Transit lanes with feeder buses connecting the city and counties down Routes 250, 360, 60, and 1, would vault Metro to the top 10% of accessible cities in the nation. Providing increased access to education, job training, employment, healthy food, medical care, and cultural gifts of our metro area to those without a car or who are unable to drive. Attracting significant economic development along corridors, as well as young professional creative class to come to and stay in the metro area. Enhancing the quality of life for all by creating the chance to avoid traffic and the need to park. Creating the possibility for people to age in place. In symbolic and very palpable ways reconciling and uniting counties and the city for the collaborative and mutual prosperity of all. Preparing us to handle and head off coming traffic congestion and parking problems as projections of population increases begin coming to fruition. Reducing carbon emission as fewer cars are on the road than would have been in car dependent metro area. Articles and studies regarding Rapid Transit are available here. As the first city in United States to develop a successful streetcar system, Richmond has a rich history with mass transit. The links below have information about Richmond's transportation past, about the vision for mass transit across the metropolitan area today, about Bus Rapid Transportation generally, and about "GRTC Pulse." Why Rapid Transit for Metro Richmond? 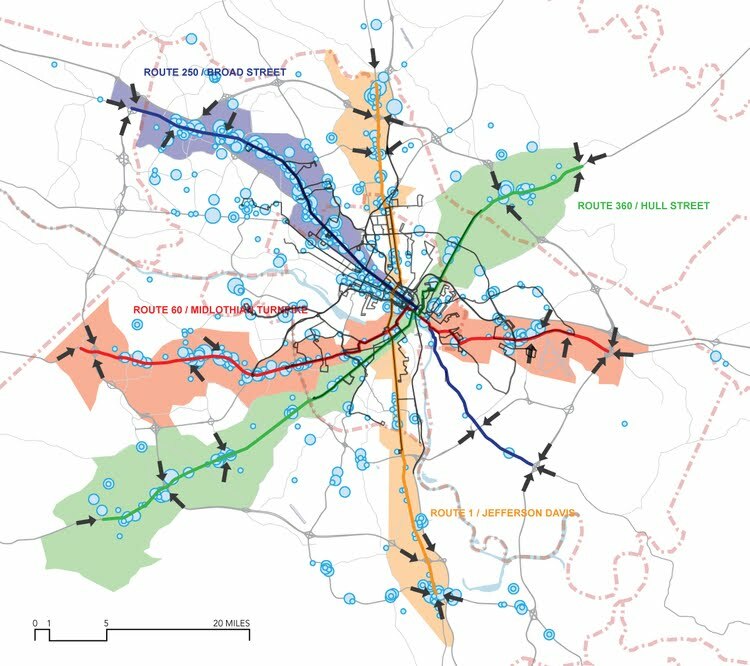 Subpages (3): GRTC Pulse Richmond's Transit History What is BRT?